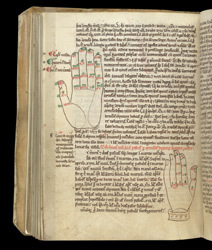 The rubric on this page states that the fingers of the hand, illustrated in the lower diagram, can be used for finding the date of Easter. Each joint or tip, from the base of the second finger to the top of the thumb, working down the fingers and up the thumb, is marked with numbers and letters. Those from the middle finger to the thumb represent all the possible dates of Easter that fall within March.